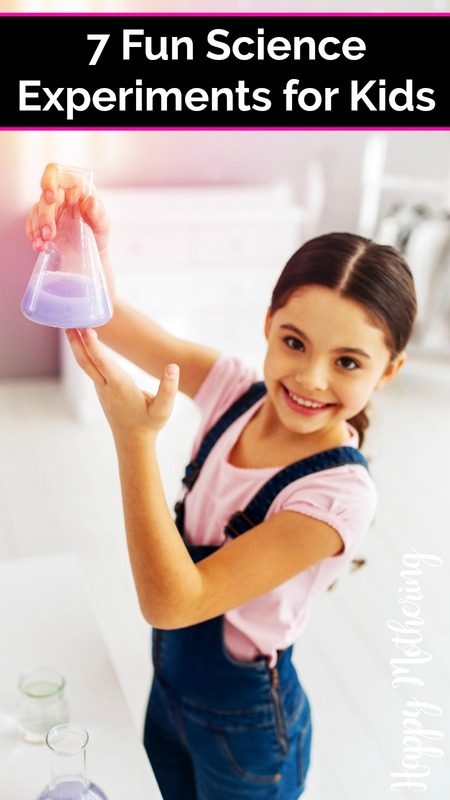 Science experiments are a wonderful way to get kids interested in science, so we put together a list of 7 fun science experiments for kids. They work at home or in the classroom! As a child, I was fascinated with science experiments. I was always playing with different ingredients and coming up with new experiments to do with friends. So it’s no wonder that our girls love science experiments too. I love homeschooling because it allows us to customize what our daughters learn based upon what they are interested in and areas they need to grow in. Science is such an important subject, and it can seem boring at first to kids unless you present it in a fun way. We love adding science shows from Netflix to our schedule, but I’m a huge fan of science experiments for kids. You can never have too many science experiments when you’re trying to encourage a love of science in your children. Fortunately, there are so many different science experiments you can do at home with kids of all ages, and the internet has made finding new ideas so much easier. We put together this list of 7 fun science experiments for kids that you can do at home. All you need to do gather all of the supplies you’ll need and follow the directions below. Whenever doing science experiments with kids, be sure that you pay close attention to safety. Be sure that you are choosing age-appropriate activities that are fun and educational. Over time, you’ll really start to see your children’s love of science bloom! Magnets are a great way to show your kids how attraction and repulsion work. When choosing magnets, be sure that you choose ones that are too large to be swallowed by a child. Then you’ll want to make a maze out of cardboard or thick paper. Put a metal object on top of the maze and slide the magnet on the underside of the cardboard to move your metal object through the maze. This is a simple and fun science experiment that works for kids in a broad age range. Gather these supplies: a bowl, half a fresh lemon, a cup of water, Q-tips, paper and a lamp. Squeeze the juice from the lemon into your bowl then add a few drops of water. Dip the Q-tip into the lemon juice and water, then write your note onto the piece of paper. Allow the lemon note to dry completely so that the message is totally invisible. When you’re ready to reveal your secret message to your friends, all you have to do is hold the paper next to the bulb of the lamp. The bulb’s heat will make the message magically appear. You’ll only need two supplies for this science experiment: a 2-liter bottle of diet cola and a package of mint flavored Mentos candy. You’ll want to do this experiment outdoors where you have a nice open area. You’ll probably want to do this yourself rather than letting the kids do it as it can be messy. Open the bottle of diet cola and quickly drop 7 Mentos into the soda all at once then quickly run to safety. The diet soda will shoot straight up into the air like a geyser. Add the soap and food coloring to the bottle. Next, pour in the white vinegar. After that, pour the water into the bottle until it’s nearly full. Add your baking soda to a small cup with a little bit of the water to moisten it. When you’re ready, pour the baking soda mixture into the bottle with the other ingredients and step back. The mixture will flow out of the bottle like lava flows from a volcano. Now all you have to do is sit back and discover which slice starts to grow mold first. Now maybe the kids will remember to put things back in the refrigerator more often! Squirt some shaving cream into the mason jar on top of the water to serve as your cloud. Next, pour the tinted water into the mason jar slowly and carefully. You’ll notice that it starts to rain under the shaving foam “cloud” when it cannot hold any additional water. As you pour it into the jar, the tinted water should make colorful patterns the kids will have fun with too. For variety, you can experiment with using different colors of tinted water! Pour the glue and the water into a mixing bowl and stir until well combined. Next, add about 6 drops of the green food coloring to the mixture and stir to combine. Finally, pour in the starch and stir until well combined. You’ll notice as you stir that it becomes thicker and more slime-like, and you’ll be able to stretch and shape it however you’d like. Once it’s turned into slime, you can store it in a sealed container or plastic bag to keep it from drying out when you’re not playing with it so it. All of these fun science experiments are easy and only take a few simple supplies. I hope that these activities will help you encourage an interest in science in your children. Do you have any favorite science experiments for kids to share?